BioWare has taken the wraps off of Dragon Age 2, the sequel to last year's hit RPG, that will follow the adventures of a brand-new hero as he struggles to rise from refugee to champion. A sequel to a hugely-successful videogame isn't much of a surprise in this day and age, so the announcement of Dragon Age 2 is hardly a shocker. What is a bit surprising, however, is the direction it's taking: Despite that huge loose thread that was potentially left dangling at the end of Dragon Age: Origins, the second chapter will be an entirely new game set in a completely different part of the world. 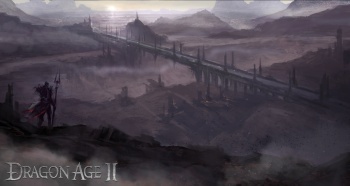 In Dragon Age 2, players will take on the role of a survivor of the Blight, a refugee cast adrift on a world in upheaval. The game will feature new combat mechanics, updated graphics and a "new visual style," and will span an entire decade as the player gathers "the deadliest of allies" and rises to become the champion of the land. In other words, it'll follow the standard BioWare formula pretty much to the letter, which means you can also expect a romance option with a troubled, reluctant sexpot, an oversized goon with a propensity for violence and a cheerful sidekick whose light-hearted wisecracking masks a deep, dark secret. Like the original, Dragon Age 2 is being developed for the PC, Xbox 360 and PlayStation 3, and while no release target has been set, February 2011 is currently the leading rumor. Sound hot? Head over to BioWare's official Dragon Age 2 announcement for more information and updates! UPDATE: EA has released a few more details about Dragon Age 2. Players will take on the role of Hawke, a refugee from the Blight who becomes "the single most important character in the world of Dragon Age." Even more important than the guy who actually ended the Blight? I'm looking forward to discovering how that's going to work. The rumored release date wasn't too far off the mark either; Dragon Age 2 has been given an official launch target of March 2011.